As I was watching the movie, Casablanca the other day, I wondered what they might serve at Rick's Café Americain. That café was depicted as an upscale night spot catering to Europeans so it would have probably been something French. Then I wondered what might be served just down the street in a more native establishment, something with a Moroccan influence. 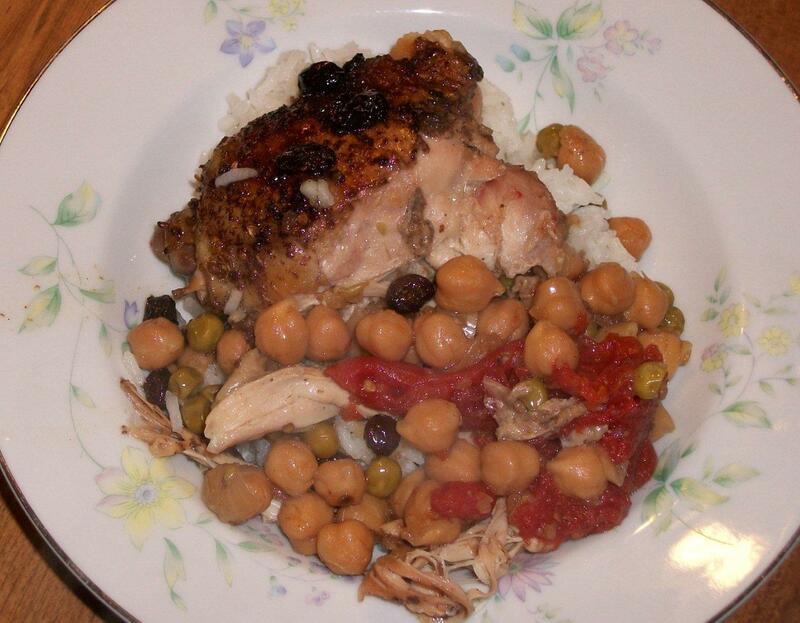 I thumbed through some old cookbooks, some even older newspaper clippings and came up with this chicken dish for the slow cooker that I think has a distinctly Moroccan influence. I hope you will enjoy as much as I have. Place the following in your slow cooker (Crock Pot), Your cubed onion, minced garlic, your drained and rinsed chick peas, your fruit (either raisins, figs or apricots) and finally the can of tomatoes which have been drained and the juice discarded. Stir gently to combine and add the chicken broth. Wash and pat dry your chicken pieces. Rub the spice mixture on both sides of the thighs and place on top of the mixture in the slow cooker. Do not add the peas or olives at this time, wait until 1 hour before final cooking to add them (you can add at the beginning but the quality will be more like canned peas) and the olives will become quite mushy. Cook on low for 6-8 hrs or on high for 4 hours. Serve with fluffy rice and add any garnish of your choice; suggestions are chopped green onions, chopped parsley or chopped cilantro. Depending on your family you can serve the mixture over the rice or drained of the juice place alongside the rice. The juice and vegetables mixed with a small amount of rice make an excellent soup the following day.